Offer to help your honey rake his or her yard…and then jump in: See who can make the biggest pile or who can rake the fastest — making things into a competition get some couples going. Rate each other’s leaf jumps: Who made the biggest mess? Who fell in the funniest or more gracious way? Use your phone to record the jumps so you can compare. Maybe even post some awesome action shots to Instagram or Facebook. Make a scrapbook with the leaves: Leaves are for more than just jumping in. Document the different leaves you and your significant other find along the way. Compare colors, shapes, and sizes. Take a moment to marvel at the wonders of nature. Create a scrapbook together where you add all the really beautiful leaves you find or add photographs of the beautiful views. If the leaves are supple enough, you can even make leaf rubbings together. Take a piece of paper, place it over the leaf, rub a naked crayon the long way against the paper over the leaf, and voila! You have a commemorative etching of your fall romp. Cuddle up and enjoy the gorgeous fall foliage: After all the leaves are raked, the pile jumping has ended and your apple pie has been consumed, you and your honey can cuddle up under a blanket or recline against a tree in the yard and take it all in. Check out your state’s peak foliage here. Now it’s time to get out there and make some magic fall moments with your honey! If you want to spread some extra love, help your parents or elderly neighbors clean up their yards too. Build up some good Karma together — and hey, you never know, the person you helped out might just give you an apple pie or some hot cider when you’re finished. 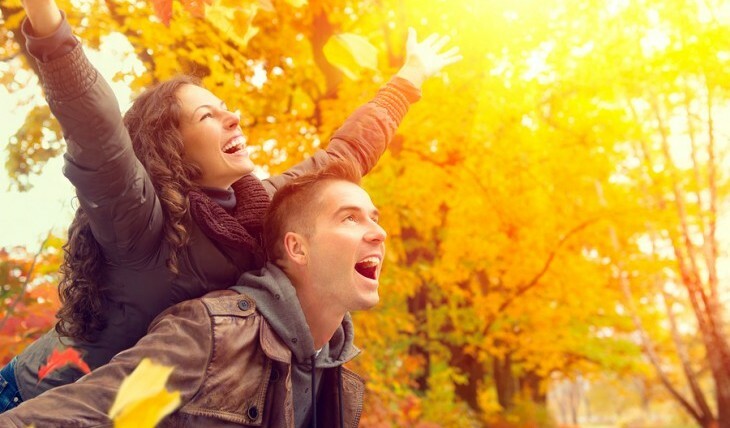 Have you shared some fun fall moments with your love? Share below!